- Everyone can take advantage of nice buffs by paying small tax of Credits or Gold Credits in-game to Buff Master located in Noria, Devias and Arena! Buff duration is fixed to 6 hours no matter you log off or get killed the buff will remain 6 hours and then expire. - The buffs are only active in Servers 1, 2, 3, & 4. Siege Buff Master is currently OFF and only character buffs will play a role there. - Buffs are automatically OFF while players warp into Duel Room. Right after the duel finishes the buffs will be added to your character instantly. 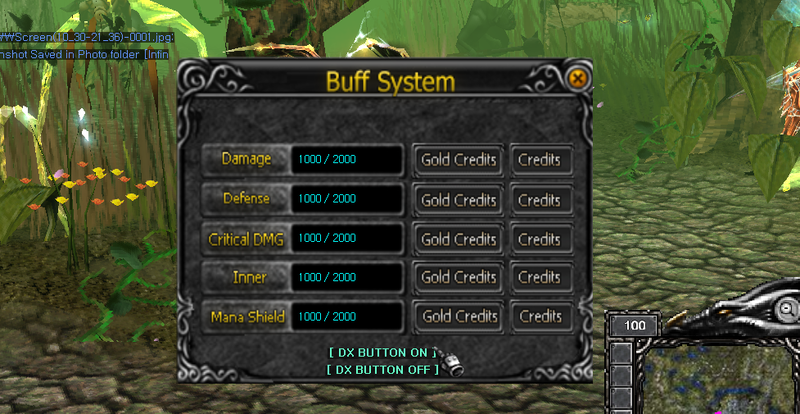 - Each of the buffs costs is: 1000 Gold Credits or 2000 Credits. It's your choice to use them or not! They are enough good so it makes significant difference in PVP! 2. Fixed a bug where SM damage bugs out when switching some item part or pet and character had to relog or die to gets fixed, now problem is gone for good and relog or death ain't necessary anymore. Same problem with Elf & MG has been solved. 5. Maintenance & updates applied to our hosting machine! 6. Maya Hands, Kundun Relics, Box of Kundun+5 and Nightmare drops were updated with all latest armors and weapons! 7. Potions cool-down increase to 150ms instead of 100ms in order to guarantee better and quality gameplay for Latins and Asian community. 3. Auto-updater host fixed - no more failed downloads of updates! 4. MG PVP power slightly improved due requests from many players. Awesome content comming up and in progress of development! Keep on support us by voting for us every 12 hours! https://www.infinitymu.net/vote - Vote and Win Free Credits! !!! !Guaranteed 1072 Credits every 24h!!!! Its fixed too and other small fixes we just forgot to note it. I will send more info if needed. It should update the game well also. As Resistant said, autoupdater will be fixed in a bit. Big thanks! You guys are great!!! Btw, thank you for the updates, to keep the server balance in terms of the pvp system.